James hit the enter button of his laptop so as to update his Facebook status. This was his seventh status update in twenty minutes. Clearly, it was a rant! Of course, he didn’t mention anybody’s name, that would be a dumb move on his part (or so he thought) neither did he tag anyone to call their attention to his post. He only posted as a way to clear his mind and get a some sympathy. Obviously, he had forgotten to keep in mind a little but important detail. Trust James’ Facebook family never to carry last, in about four hours, that particular status was already trending with many derailing comments, saucy hashtags, insulting posts and funny memes about how wicked, and uncaring most bosses of private organisation are. 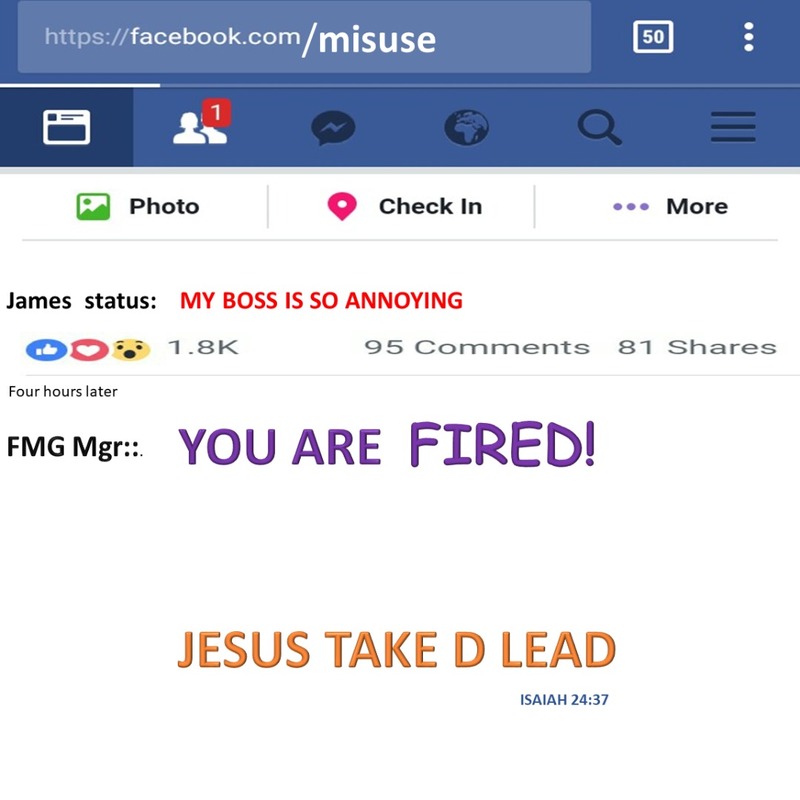 His boss then added his comment to James post four hours later. Perhaps the most important detail he should have bared in mind was that he had accepted the friend’s request of his boss about three months earlier. “James, you joined FMG.org less than six months ago. You have absolutely no idea about our operations but we gave you an opportunity to learn and grow. More so, you are still on probation. He then tagged, the HR and Admin of FMG.org to the post saying. “@HR, look for another, for James is no longer part of us. Humm, many have indeed misused their social media platforms as spaces to insult, to comment derailing words, to curse, to scatter marriages and do several unwise things. “What is on your mind?” is not a license to say it all. Be wise then, your social media should glorify God. Hmmm.. One is 100% responsible for his/her social media posts. Incredible! Yes sir, you are correct!